My fever dream of a Robot Arcade in the library has practically come true. 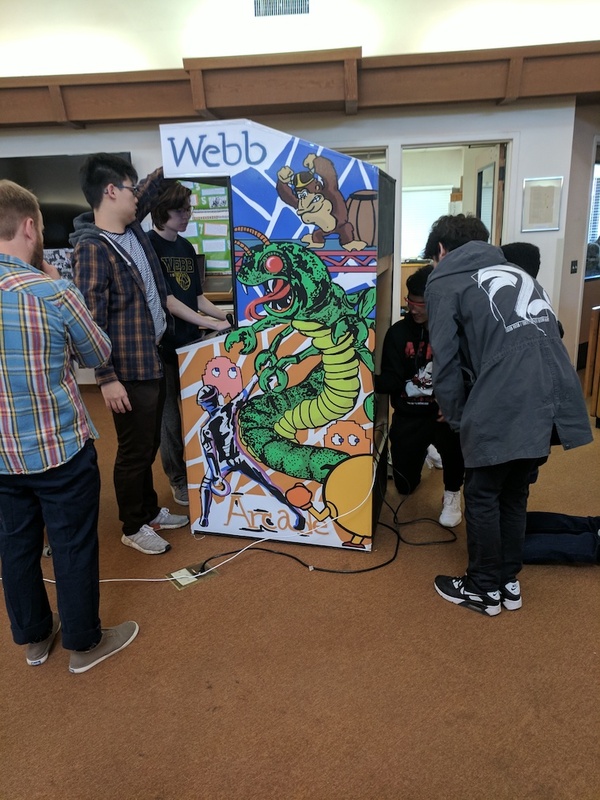 During a special extra-curricular event called Unbounded Days, students recently put the finishing touches on our own video game cabinet. 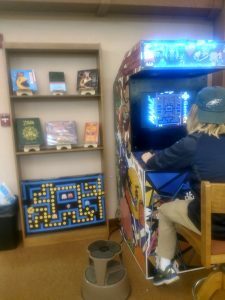 Now, students and teachers alike can come into the library and test their mettle on games ranging from Pac-Man, Donkey Kong, and Mortal Kombat. Next up, student-designed games! 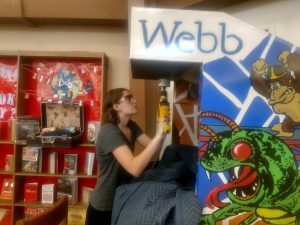 Webb students trouble-shoot the video game cabinet during Unbounded Days. 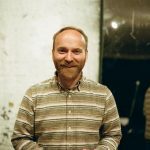 Photo by Ingrid Leventhal. 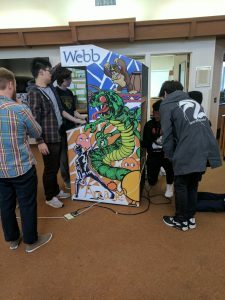 The cabinet was built from scratch and is the fruit of a collaboration that involved many student minds. It took five years to accomplish. 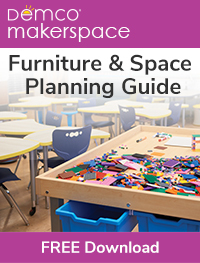 The school’s tech director and I served as advisors: we helped organize meetings, take notes, and find resources. However, the work and design were done entirely by students. Since the cabinet was developed and built outside of the bounds of the school’s curriculum, we relied on the students’ talents, passions, and motivation to come in on their free time and contribute to the project. No single person had a hand in every aspect of the build: the cabinet worked more like a baton being passed from engineer to artist to programmer and back again. The artist who designed the wrap-around artwork described the gratification of seeing her work iterate through drafts on her iPad and then come to fruition IRL at an impressive scale. The student who mapped out the wiring of the controllers left detailed notes to help aid the unknown team who would come and take the reins. The student who led the project’s push over the finish line focused on the wiring and software deep into scheduled breaks (including lunch; I had to remind him multiple times to stop and grab some nourishment). He even returned to make additional improvements after the Unbounded Days program concluded. The ultimate power-up is the trust, care, and focus that I witnessed throughout the problem-solving process. 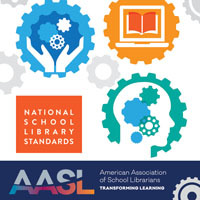 Not only does this cabinet open the possibility of increased opportunities to promote computer science, it also represents an opportunity to highlight multiple literacies that might otherwise go unappreciated in the library. 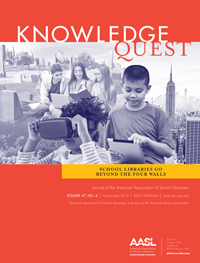 Patrons activate ludic literacies, or skills and sensibilities around identity and play, as they talk through games, share experiences, and negotiate meaning in play-based scenarios. My patrons (students and teachers) plumb artifactual literacies as they share memories about specific games. They often discuss cultural context of the games and the role that the games play in their lives. Our school boasts strong bonds between students and teachers; this cabinet has encouraged new opportunities for students and teachers to share experiences and communicate on a personal, playful register. Furthermore, I have written about karaoke and songs as social artifacts. Video games are likewise odd and entrancing artifacts that invite time and harken to specific experiences. In terms of affect, these artifacts have an uncanny ability to stoke laughter and joy (as well as frustration). The journey to playable games may be complete, but the adventures are just beginning. Along the way, I am confident that my library, a center for literacy, learning, and media, will be made a better, more vibrant place thanks to this cabinet of curiosity.